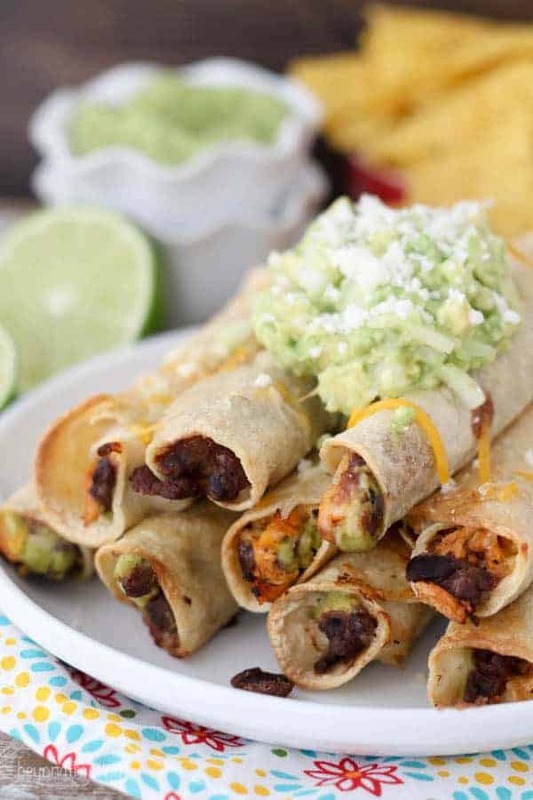 These Baked Chipotle Chicken Taquitos are filled with chicken, beans, cheese and a spicy tomatillo avocado salsa. Baked and not fried, these crispy taquitos are the perfect weekday dinner. Let me introduce you to our one of our favorite meals, Baked Chicken Taquitos. If there’s chicken involved or if it’s Mexican food, we’re probably having it for dinner. It took me a couple of times to perfect my craft of filling and rolling, not because it’s difficult, but because there are so many things inside! 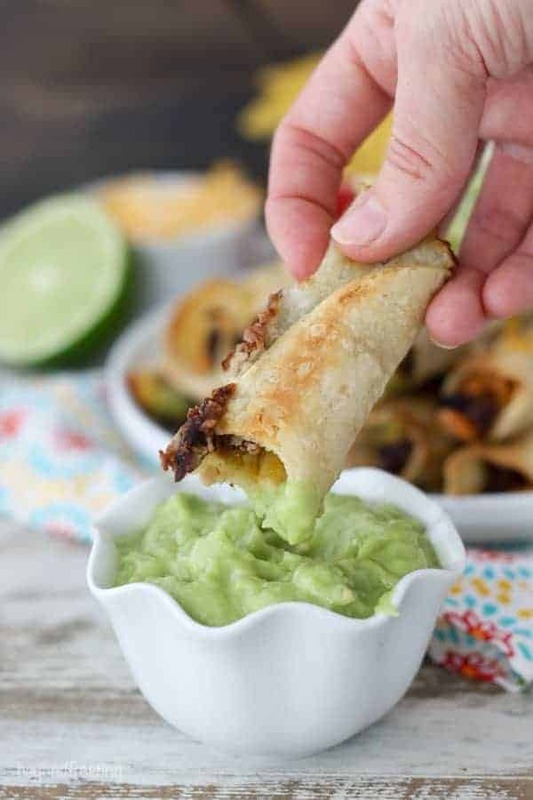 Besides the shredded chicken, these taquitos are also stuffed with refried beans, a sprinkle of cheese and some spicy tomatillo avocado salsa, which is perhaps our favorite part! The original recipe for chicken flautas, is from my friend Trish’s cookbook, 100 Ways to Use Rotisserie Chicken. I was super impressed with all the various recipes in this book, It’s pretty genius if you ask me, and quite the time saver! 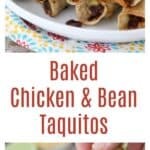 I asked my fiancé to mark some recipes in this book that he would like to try, and I was pleasantly surprised how many recipes he picked, and of course one of them was the baked chipotle chicken and black bean flautas. We decided to change a few things from Trish’s original recipe. We used refried beans because they’re easier to spread. 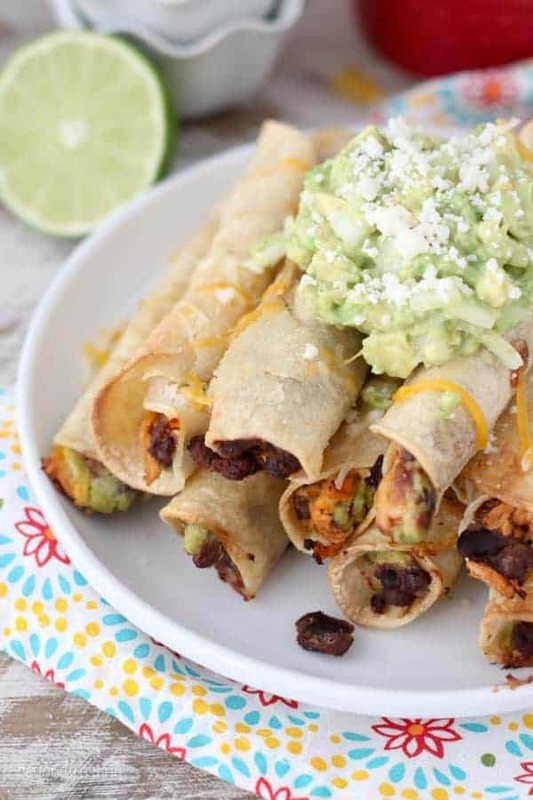 Black or pinto bean doesn’t really matter, but they should be heated and warm when you roll the taquitos. We also prefer the taste of corn tortilla instead of flour, so we always use corn tortillas. That’s the difference between a flauta and a taquito- flour vs. corn tortillas. Our favorite ones to use are the Guerrero brand. I also learned that it really helps to heat the tortillas in the microwave with a wet paper towel first. This makes them soft and pliable, thus easier to work with. Lastly, the cheese. I need the cheese. It helps bind the filling together. Since there’s not a whole lot of room in there, I use a finley shredded Mexican blend cheese or cheddar cheese. Pepperjack would also be good! My fiancé also really isn’t a fan of rotisserie chicken, so we grill our chicken and season it with an all seasoning. It does add to the overall prep time, but it’s fine with us! If you want to cut down on the prep time, you should definitly consider using rotisserie chicken. I love that Trish’s recipe uses chipotles in adobo sauce to flavor the chicken. It adds a little bit of spice to the chicken. We also squeeze a full lime over the chicken. Finally, we started adding some tomatillo avocado salsa to our taquitos. Originally this was used as just a dipping sauce, but then I started adding some to the inside of the taquitos as well. We like the kick of spiciness that it adds. If you’re not one for spicy foods, I wouldn’t suggest you just skip the tomatillo salsa. It’s kind of amazing. The tomatillo-avocado salsa is a recipe from Rick Bayless Did I mention we like Mexican food? This salsa is SO addicting! I also like adding it to my eggs in the morning. When the first batch goes in the oven, I start rolling the second half. These are sprayed with cooking spray and baked about 12 minutes on the first side and then you rotate them and bake for another 5 minutes. This gets them nice and crispy! I always recommend baking them on a silicone baking mat, because it helps prevent them from burning and sticking to the pan. In full disclosure, this is not the quickest recipe (if you’re gilling chicken and all). It makes about 30 taquitos, and we never finish them all it one sitting. They reheat nicely though, so we baked them all and have them for lunch the next day. Even if it takes a little time to make these, it is SO worth it, because these are amazing. I know that when I make them, my fiancé loves them and he appreciates it even more because he knows it’s not the quickest meal. 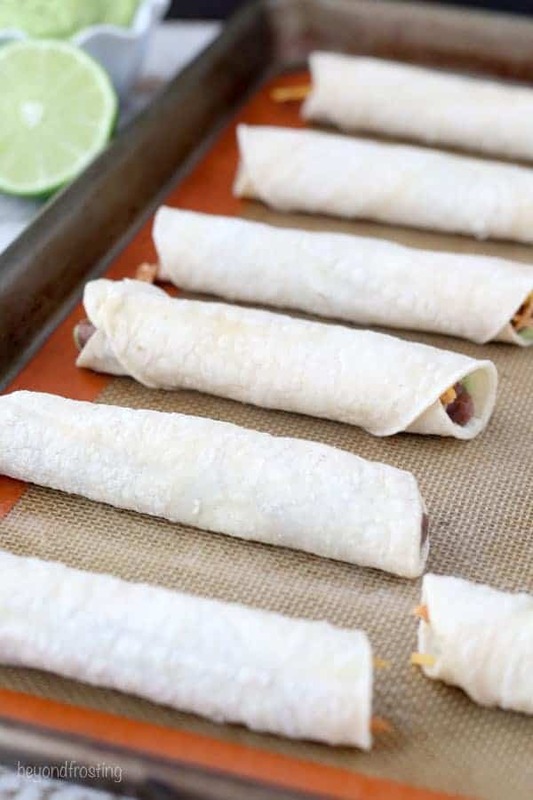 You can totally customize these taquitos based on your likes and dislikes too. Be sure to pick your favorite toppings for these! 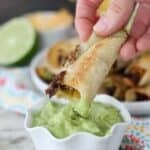 I love serving these with a blender salsa or my easy guacamole. You might also like sour cream as well. 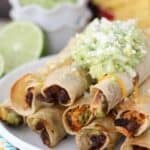 These Baked Chiptole Chicken Taquitos are filled with chicken, beans, cheese and a spicy tomatillo avocado salsa. Baked and not fried, these crispy taquitos are the perfect weekday dinner. Season and grill the chicken until thoroughly cooked. Use your stand mixer or two forks to shred the chicken into small pieces. Stir in 2 chipotle peppers and 2 teaspoons of adobe sauce. Toss the chicken until thoroughly coated. Squeeze the lime juice over the chicken and toss. Prepare a can of refried beans, cooking over medium to low heat until the beans are well heated. Prepare a batch of tomatillo avocado salsa. To assemble the taquitos, preheat the oven to 425°F. Wrap 6 tortillas at a time in a damp paper towel. Microwave for 45 seconds. Take one tortilla and assemble the filling in the middle of the tortilla. 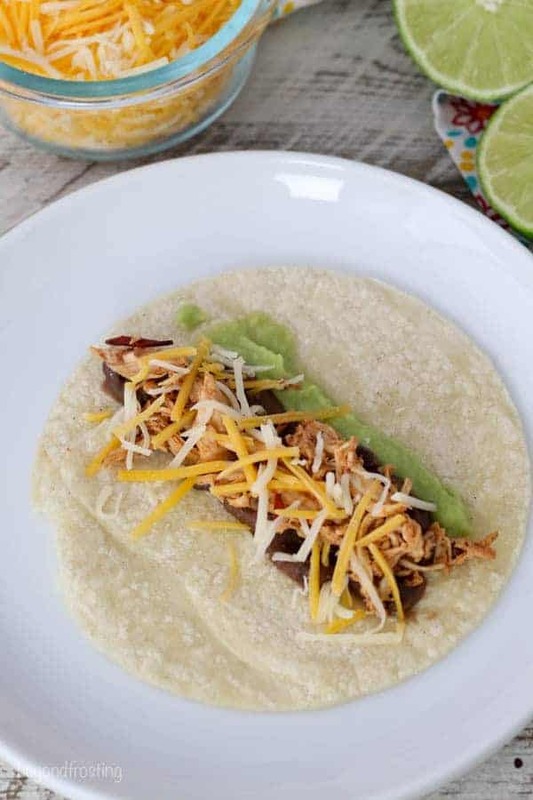 One spoonful of refried beans, about 1 teaspoons of tomatillo salsa, a pinch of cheese and shredded chicken. Roll the tortillas tightly and place seam-side down on a large baking sheet lined with parchment paper or a silicone baking mat. Spray the tops with cooking spray. Bake at 425°F for for 10-12 minutes. Rotate the taquitos so the seam side is up and bake for an addition 5 minutes. Save leftover chipotle and adobo sauce. Place 2 chipotles about 1 tablespoons of sauce in a Ziploc bag. Seal and freeze. 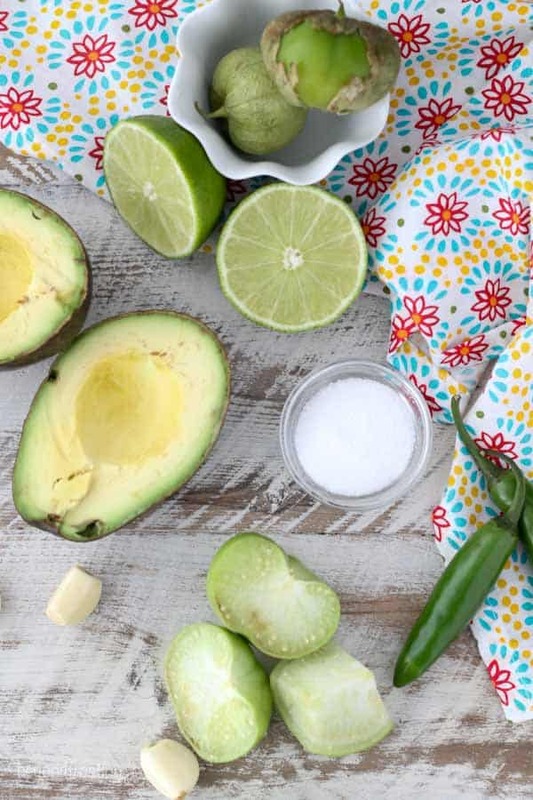 A simple green, spicy salsa blended with tomatillos, avocado and serrano peppers. In a small food processor, combine the tomatillos, garlic and serrano peppers. Blend until smooth. Next add the avocado, lime juice and salt and blend until thoroughly combined. Refrigerate leftovers in an airtight for up to 3 days. Originally recipe from Rick Bayless.